Nautilus Hotel is conveniently situated off the main arterial route, on Wimbi Beach – the finest and most pristine shoreline in Pemba Mozambique. It is close to Pemba Town and Port, and only 3kms from Pemba Airport. 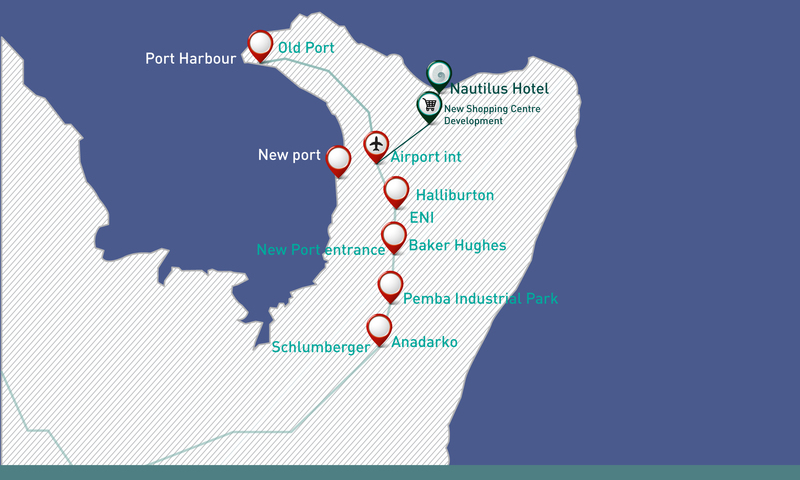 It’s also just 8kms from Pemba Industrial Park – www.pembaindustrialpark.com. Pemba is a port city in northern Mozambique. It is the capital of Cabo Delgado province and lies on a peninsula in Pemba Bay with a population of over 108,000 people. The town of Pemba has an authentic local market and there are banks, patisseries, supermarkets and restaurants. Built over rolling hills, many of the local population live in traditionally built houses made from ‘pau-pique’ and bamboo nestled amongst the majestic baobab, cashew and mango trees. The old part of town, known as the ‘baixa’ boasts the old colonial buildings, some of which are in a state of disrepair although the charm of bygone years is still evident. Pemba Mozambique is a prime destination for water sports. Nearby coral reefs offer excellent diving and snorkelling opportunities, and sailing and deep sea fishing charters are popular. Between June and October, you’ll find hump back whales, and you can often even see these majestic creatures from the beach. The climate is tropical humid and average annual temperatures range from 22 °C to 32 °C. The hot and rainy season usually runs from December to April. Rain can be heavy and be accompanied by strong monsoon winds. The dry season is from May to November, with average temperatures of around 28 °C during the day. The temperature of the sea water ranges from 25 °C to 30 °C. Wimbi beach, home to the Nautilus Hotel is the main draw of this sunny seaside town.